Prospector, captain, mayor, trader, settler, craftsman, or builder? Which role will you play in the New World. Puerto Rico is one of those strategy games where you not only have to plan ahead, it is also critical to be aware of what your opponents are up to. Each player’s turn starts with the selection of one of seven available roles. Each role brings a unique advantage to the player selecting it, but allows all players to use that role in turn. Timing of when to select a particular role is critical. Each player has a player board with twelve spaces for plantations and twelve spaces for buildings. There are five different crops. Each crop, except corn, must be paired with its matching production building to generate goods. Goods can then be sold at the trading house for money or placed on ships to earn victory points. Money will be necessary to buy not only production buildings, but also markets, warehouses and a variety of other buildings with added abilities for the player who owns them and populates them with colonists. Colonists must also be on plantations for them to produce. In addition to the four types of production buildings and twelve special buildings there are five large buildings whose sole function is to provide victory points at the end of the game. Each building also has a victory point value. Puerto Rico is one of those games that will have you coming back for more. The first time you play, you will know you could play better. There is just a lot to keep track of. Timing in role selection is significant. Then all you to do is manage your buildings, your plantations, your colonists and your money better than everyone else. There are many paths to victory and it would be fun to try them all. 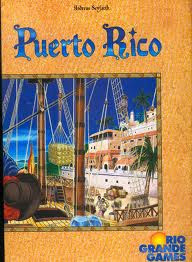 We have an open copy of Puerto Rico available in our Demo Games Library for you come in and try.